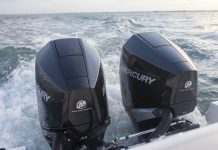 The 2019 edition of the Toronto International Boat Show has an exciting brand new feature this coming year – Women’s Day! 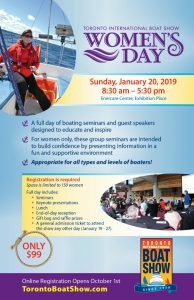 New this year, Women’s Day is a one-day educational opportunity for women of all levels and types of boaters! A full day of seminars, guest speakers and interactive sessions, all designed to educate and inspire women to get out on the water! All events during the day are intended to build confidence by presenting information in a fun and supportive environment. Built into the day will be time to meet other like women, ask questions, share stories and create communities that will live on outside this one day! Space is limited to 150 women. Online registration is now open! – click here.